Contents: Preface. Guide to Scale Names Referenced in Text. 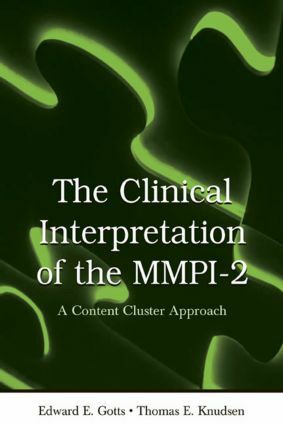 A Content Cluster Approach to MMPI-2 Interpretation. Assessing the Quality of the Test Record: The Validity and Response Style Scales. Status of the Basic Scales. Synopsis of the Special Scales: Sources and Interpretation. Overview and Results of a Clinical Research Program. Renewing the Old: Scale Recoveries and Losses. New Developments for MMPI-2. The DSM and Axis I Conditions. Clusters, Personality Traits, and Disorders. Prognosis and Risk Management Scales. Conjoint MMPI-2 and Rorschach Interpretation. Interpreting the Individual MMPI-2 Record. Appendices.